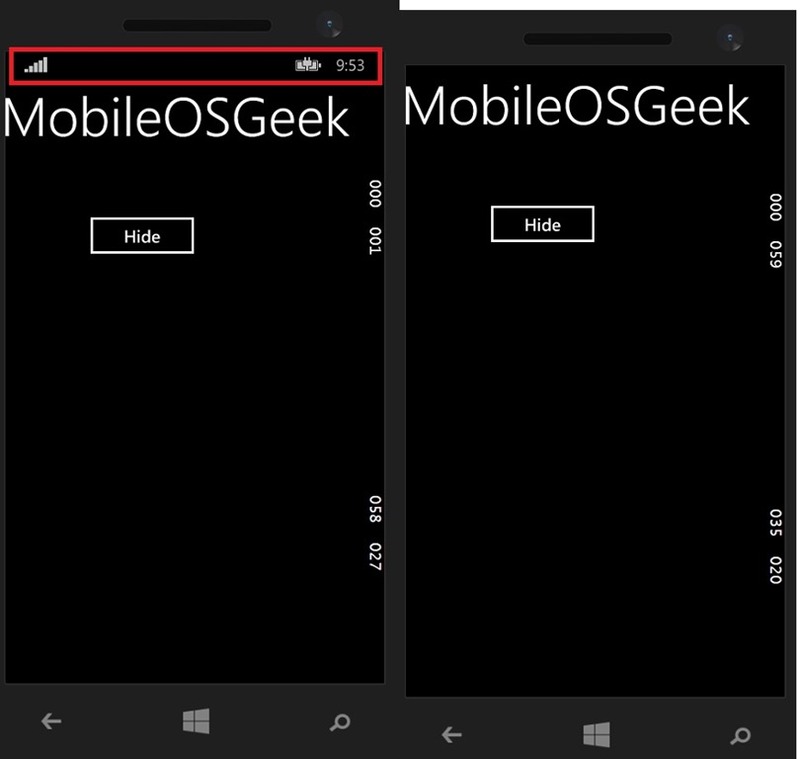 How to Hide Status Bar in Windows Phone 8.1 XAML App ? Windows Phone 8.1 and Windows Runtime Apps How to #3 – How to make a Phone Call in Windows Phone 8.1 XAML App ? Windows Phone 8.1 and Windows Runtime Apps How to #5 – How to Pass Objects when Navigating between pages in Windows Phone 8.1 XAML App ? In Windows Phone 8.0 , the developer could use the SystemTray.IsVisible property to hide or show the System Tray / Status bar . When the developers target the Windows Phone Silverlight 8.1 , they could still use the SystemTray.IsVisible and set this value to false to hide the status bar. But what if the developer targets Windows runtime app ? If you are a developer targeting the Windows Phone 8.1 & Windows runtime or even the Universal App , then you should be using the View Management to get the Status Bar and hide it using the HideAsync method to hide the status bar as shown below. // Get the Status bar for the Current Window. The ‘await’ operator can only be used within an async method. Consider marking this method with the ‘async’ modifier and changing its return type to ‘Task’. Could you let me kknow more on what was the code snippet that you made test on ? Why can I not show the status bar again after hiding it once. I want to make it a toggleable setting – to show / hide the status bar. But, after hiding it once, it is not possible to show it again.